Publisher: Stormcrest Games. Designer: Randy Van Gelder. Year Published: 2017. Players: 2 – 4. Time: 25 – 45 min. Age: 13+. Weight: 1/5. REVIEW BY CATHY. 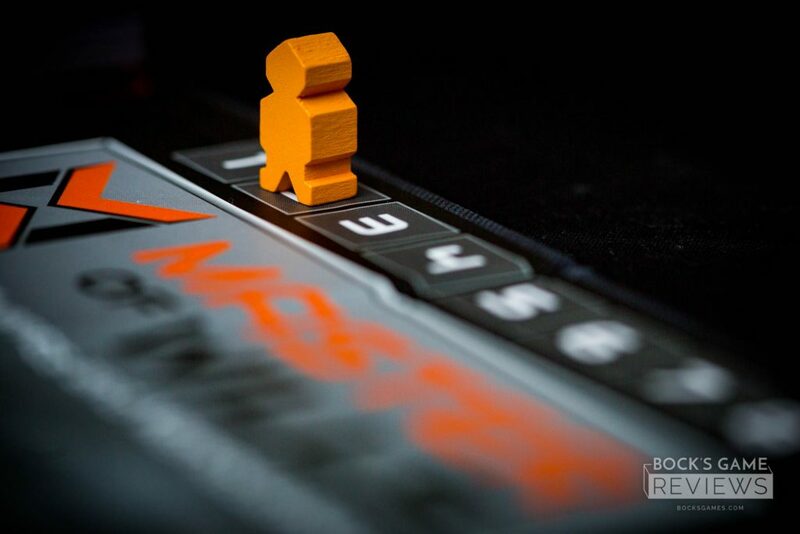 Two-player card battle games aren’t everyone’s cup of tea. They tend to have familiar mechanics, a bit of luck (what’s going to come out next in your carefully crafted but shuffled deck), and dark fantasy, superhero, or cyberpunk themes. 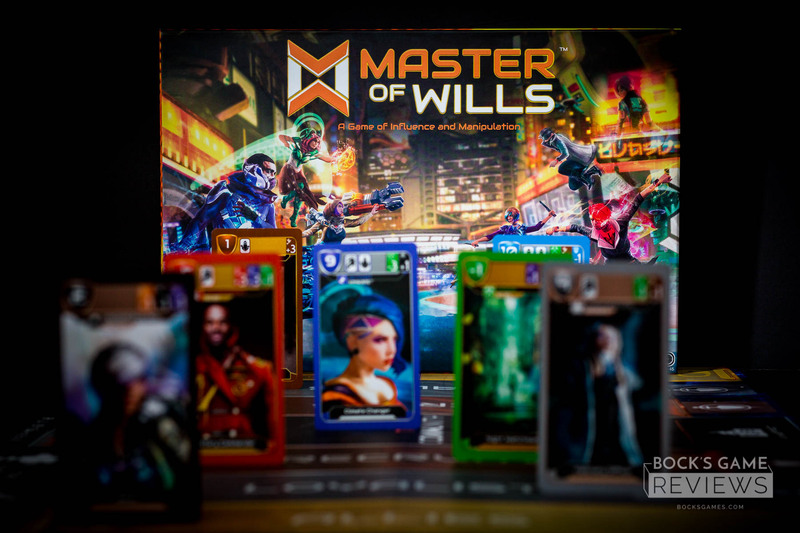 While Master of Wills doesn’t bring anything new to table theme-wise (although I don’t think I’ll ever tire of cyberpunk), mechanics-wise it feels different, fresh, and engaging. 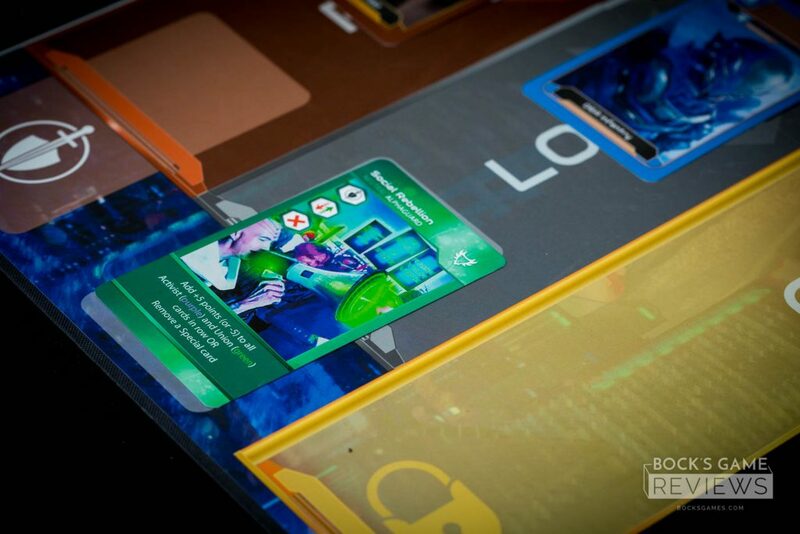 In Master of Wills, the rectangular board is rotated lengthwise so that each player sits on one end. 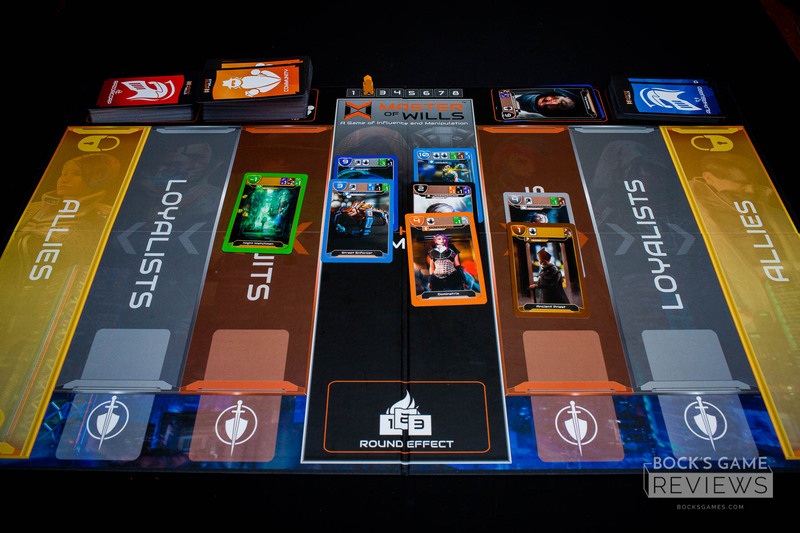 You have your side of the board and your opponent has theirs, with a neutral zone in the middle. 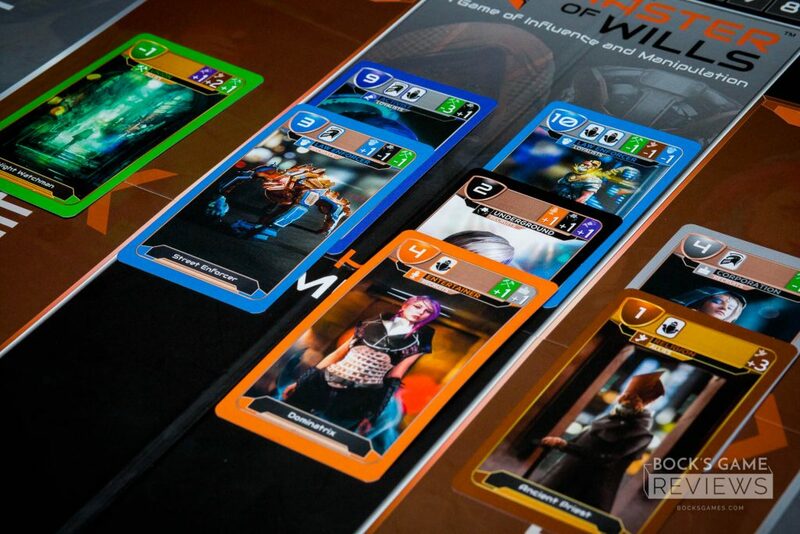 Community Cards (members of various sectors of society that you want to bring into your faction) will enter play in the middle, and it’s your goal to get those cards (and the points on them) to move to your half of the board in order to have the most points at the end of eight rounds. 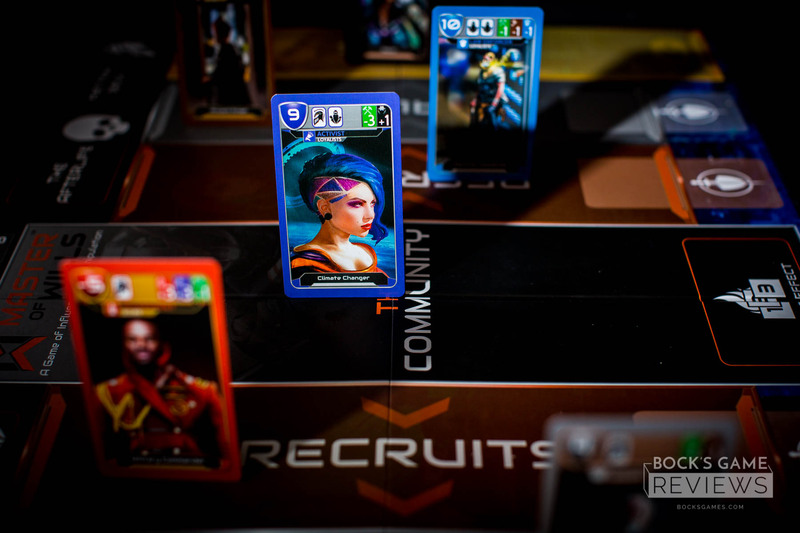 Choosing a Community member to activate from the neutral zone doesn’t just mean that you get to move that card to your side of the board. Convincing them to join your faction affects other Community members on the board, persuading or dissuading them of your cause. You may be required to push a Government member (red card) one space away from you and into your opponent’s territory. Or you might get to bring a Law Enforcer (blue card) two spaces closer to you. And getting those cards all the way to your endzone, the Allies section, means they can never be moved and are guaranteed points at the end of the game. Master of Wills is tug-of-war without the rope burn. 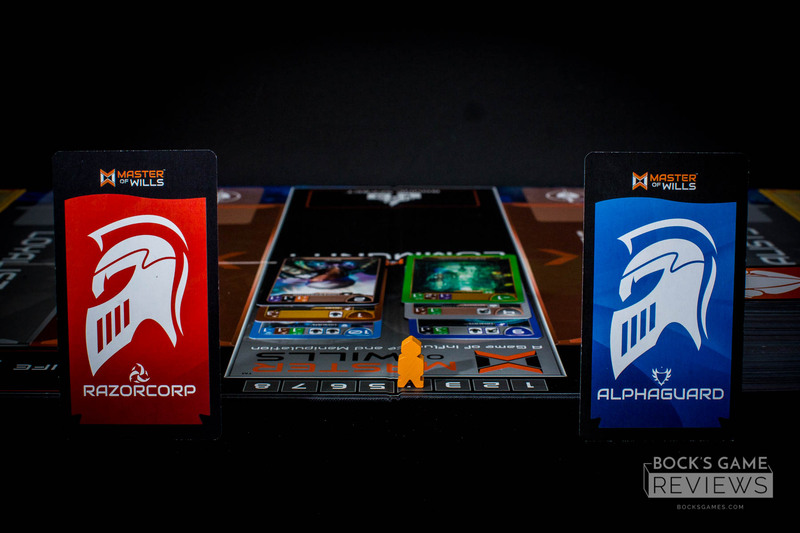 That 14-point Union member (green card) might be on your side this round, just one step away from your safe and hallowed Allies area, but then pulled back to the middle and then into your opponent’s side on the next round. Just this back and forth play is fun and engaging. But what really makes Master of Wills shine is the faction decks. 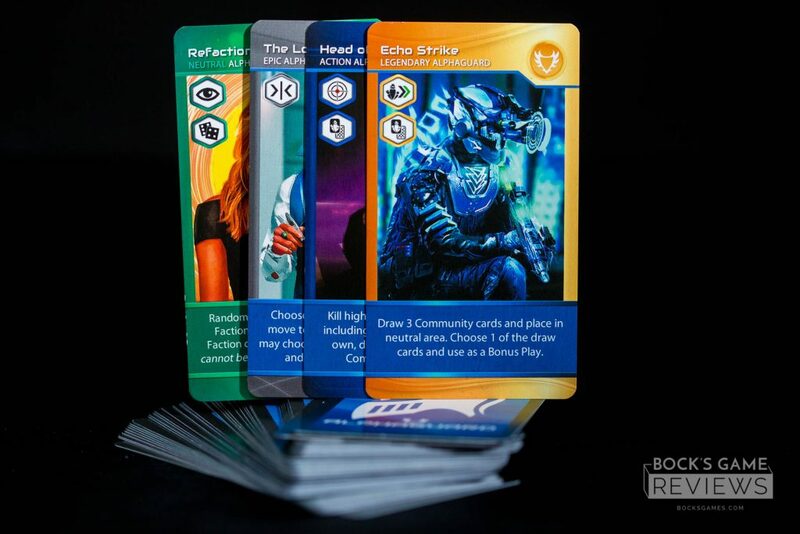 Each player has a deck of cards that they craft at the beginning of the game, selectively whittled down out of a pre-made deck assigned to your faction (or one of the upcoming expansion decks). These cards bring dramatic swings into the game and also allow for keen strategy and quite a bit of deviousness. There’s a huge variety of cards, each providing a different effect, some immediately moving cards from your opponent’s side to yours, some killing cards from the board completely, and others placed in a row directly on the board, affecting cards of a certain color whenever they enter that row. This variety of cards really allows you to craft a unique and focused deck. But…while I love the deck-crafting in this game (I go for the kill cards every time), I don’t ever feel like my grand plans ever come to fruition. I spend all that time building a deck, selecting just the right cards, but then it’s only an eight-round game. And not every Community Card even allows you to play a faction card. After getting excited about the strategy built into my deck, I never get to play enough of the cards to really feel satisfied, to really feel like the time spent making my deck was worth it. We house-ruled a couple of extra rounds to give us a little bit more of a meatier play and that definitely helped. While all of my plays of Master of Wills were two-player, the game also has a 4-player team variant. David gave it a try and was pleasantly surprised at how well it worked. In his opinion it gains a cooperative aspect. You can freely talk with your partner about what cards you each have and discuss strategy. And even though you have half as many turns in a 4-player game than a 2-player game, you still feel like you played a full game because you are also so involved in your partner’s turn. Despite my feelings on the faction cards, I absolutely love playing Master of Wills. 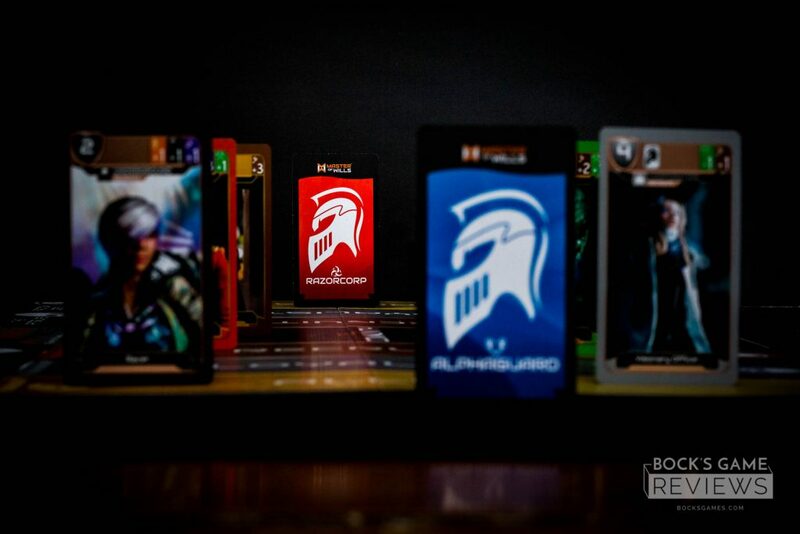 It’s a card battle game that just feels different than the others. It was refreshing, fun, and quick. And most importantly, I think, it was easy to teach and easy to catch on. There’s not a ton of AP going on, so it really moves quickly. I would definitely recommend this to anyone looking for a fun and quick but super-competitive 2-player game.